Home > Budget > YOU AND BUDGET 2018: IT COULD HAVE BEEN WORSE! 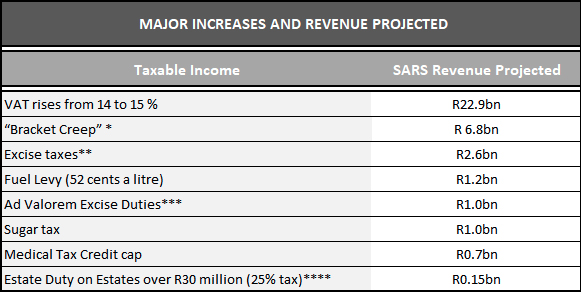 In the Medium Term Budget Speech (MTBS) last October, Finance Minister Gigaba laid out some frightening numbers – tax revenue was not rising as predicted and expenditure was inexorably increasing. The forecasted spending ceiling was breached and the message for Budget 2018 was clear – “Expect substantial tax hikes”. In the end, there are indeed R36 billion’s worth of tax increases, but also the Government will put in place spending cuts of R85 billion over the next three years. The combination of tax increases and spending cuts is an important step towards restoring fiscal credibility. Many commentators called for an increase in VAT but were doubtful that Government would push through such an unpopular and regressive (regressive in the sense that it impacts more on the poor than the rich) measure so close to an election. Yet a 1% increase from 1 April headlined the Budget. This is the first VAT increase in more than 20 years. The two other main contributors to tax revenue – company and individual tax – are already at high levels and further increases would likely prove to be counterproductive, again leaving Government short of its revenue target. Lower income groups will also benefit from an increase in thresholds for the bottom three personal income tax brackets. Globally, the world is increasingly moving towards indirect taxation as it brings more certainty to the fiscus in that it is a relatively simple and robust collection process. In the past few years, the affluent have been inundated with tax increases. VAT is paid by all consumers and so spreads the load of the tax burden. The concern remains that this regressive tax will impact adversely on vulnerable households despite the existing zero-rating of basic food items and despite the cushioning effect of an above-inflation increase of 7% in social grants. On the other hand some economists support it as increasing fairness in our tax system and as the tax least likely to damage the economy. For business, the VAT rate change will however mean more costs as a result of extra administration in changing your systems and stationery. Start preparing now! * Personal Income Tax brackets are not adjusted for inflation so any increase in your salary (even just an inflation-linked increase) could push you into a higher tax bracket. ** Excise Tax on cigarettes is up 8.5%, whilst alcoholic products will see excise tax increase by between 6% and 10%. *** Ad Valorem rates will increase on luxury goods from a range of 5% to 7% to a range of 7% to 9%. **** The duty is levied on the dutiable value of an estate at a rate of 20% on the first R30 million and at a rate of 25% above R30 million. Donations tax increased by 5% in line with that. What will Government prioritise on the expenditure side? Basic education will receive R792 billion whilst tertiary education gets R324 billion (R57 billion for free education including R12 billion this year). This follows President Zuma’s concession to the Fees Must Fall campaign. Health Care gets R667 billion. Basic services to low income households R205 billion. R129 billion for public transport. R126 billion for water infrastructure and services. Analysts, ratings agencies and investors look at economic ratios as part of the process in determining how a country is performing. Together with an improved growth outlook, the proposals will reduce the consolidated budget deficit to GDP from 4.3% in 2017/18 to 3.5% in 2020/21 – as best practice is close to 3%, this is a good trend. Net debt to GDP was forecast at over 60% by 2023 per the MTBS and is now expected to fall to 56.2%, also a positive indicator. Generally, this should be below 50% but this is now heading in the right direction. Inflation is expected to be benign for the next three years and contained within the 3% to 6% mark. GDP is estimated to increase by 1.5% this year, by 1,9% in 2019/20 and by 2.1% in 2020/21. As our population is growing at 1.35%, this means that real growth per capita is projected to rise in the medium term. All of these ratios will hopefully give comfort to investors and ratings agencies. It remains to be seen how achievable they are but our new President seems to have substantial credibility. The Carbon Tax will be effective from 1 January 2019. As this is expected to be complex and will require considerable set-up time, start preparing for it now. Another point of interest is that government departments and parastatals are mandated to pay suppliers in 30 days – failure will result in management facing charges. That’s good news for suppliers struggling to keep their cash flows positive. The Minister mooted several retirement reforms such as that pension and provident preservation funds will be allowed to make transfers to a retirement annuity fund (after the retirement date of an employee). This was excluded in the retirement reform proposals of 2017. For a comprehensive guide to the 2018 Budget, there is an excellent summary by SAICA downloadable here. What about Junk Status and investor confidence? Moody’s is the only major ratings agency not to have fully downgraded South Africa to junk status. 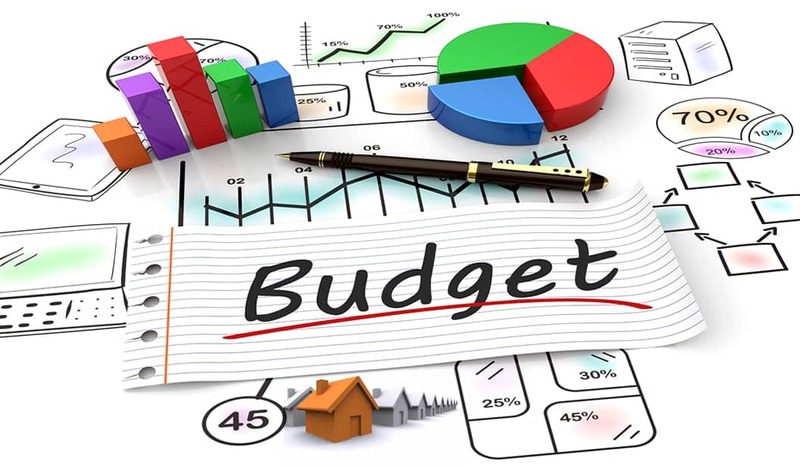 Government’s commitment to getting financial discipline back into the budgeting processes within government plus the bold decision to raise VAT will hopefully be welcome news to ratings agencies. It should also be attractive to potential investors – something needed to grow the economy and jobs. In tone, this is a Budget which builds on the rising hope the nation has experienced since our new President was sworn in. It confronts corruption head on (for example, the proposed reforms to procurement rules), tackles tax administration and declining tax morality and clearly seeks to contain expenditure, plus relaxing regulations where possible. Above all, it was pragmatic and in increasing VAT seeks to spread the burden of tax increases. Not nearly as bad news a Budget as some feared it might be!